This book was one of those huge books I thought I’ll never actually be able to finish reading. I started reading it in the end of July and I’m quite surprised that I got to the end of the book, considering that I had started to read it from the beginning on to other occasions, first when I received the book two years ago as a birthday present and about year later when I couldn’t go to sleep after finishing some other book. After the bombs were sent out to Hiroshima and Nagasaki, he was the most famous physicist in the US, perhaps second only to Albert Einstein. 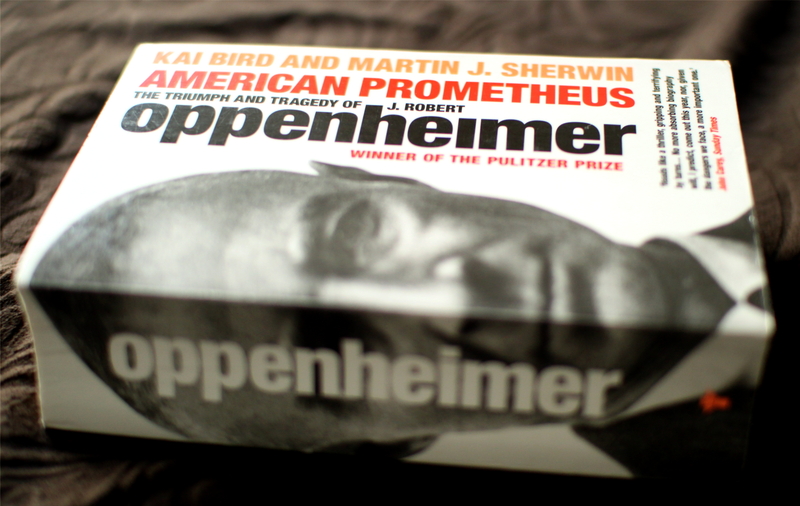 However as the subtitle of the book suggests besides the triumph of the atomic bomb there was also a huge tragedy – in the end on 1930s, Oppenheimer and his wife Kitty had had leftist views in politics and many thought they had been communists, Robert’s brother Frank had even been a member of the Communist Party. The problem arose in 1950s when there was an inquiry as to whether Robert should have and should even originally have been given security clearance to work on the bomb and later to be an adviser in a committee to the government. Robert had had a lot of friends and students who had supported the communists’ views and as he had been under surveillance by the FBI already from the beginning of the Manhattan project – being followed and and having wiretaps (mostly illegal) on his phones, he lost his clearance. Though that appears to have been only a small part of it, Oppenheimer opposed the building of the hydrogen bomb and tried to slow down it’s production and by doing that had also gained some enemies among scientists. As there was already a race between the Soviet Union and the United States, then his actions were not taken lightly or positively, since developing the hydrogen bomb would naturally also have to be the next step for the Soviet Union. The book was interesting for most part, though there was a lot of politics involved, which was kind of dispiriting, as it took so much time to go through… otherwise quite excellent and the ending somewhat sad.